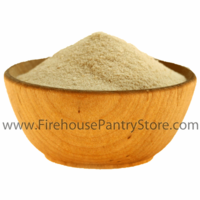 Malt vinegar powder is used to add tartness and flavor to seasonings, rubs, marinades, barbecue sauces, salad dressings, and dry mixes. Achieve that authentic fish shop flavor when you sprinkle it onto fried fish and shrimp. Mix with salt to make a mouth-watering seasoning for French fries, homemade chips, and even steamed broccoli. Stores and travels well - great for emergency food supplies, camping, boating, and RVing. Volume: 1 pound equals approx. 3.45 cups. Ingredients: corn maltodextrin, malt vinegar, modified food starch. Contains gluten. Packaged in a facility that packages wheat, milk, soy, egg, peanuts, and tree nuts.